The Data-Ink ratio is a concept introduced by Edward Tufte, who has contributed significantly to designing effective data presentations. Tufte refers to this concept as the non-erasable core of a graphic, the non-redundant ink arranged in response to varioation in the numbers represented. This leads to Tufte’s goal: “Above all else show the data”. As you can see in the chart, the amount of ink used to display such a small amount of data is not proportional at all. This leads also to the amount of space used to show the ranking for both genders, forcing the user to scroll to see one gender or another. b) if values are more or less dispersed in a gender or another. 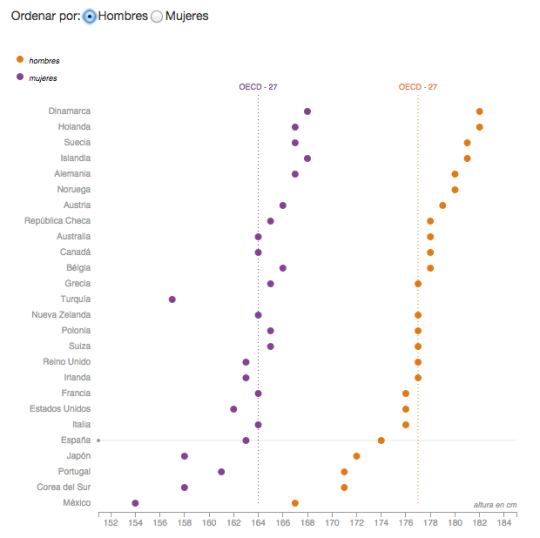 I also find useful to have the median of the OECD countries as a threshold instead of being part of the values in the vertical axis (although this threshold is visually 100% effective for the sorted gender). Another possible change would be to swap the axis, arranging the height scale vertically, so it’s more ‘natural’ to encode height’s values in the vertical axis.